Your one-stop blog for all Toronto Cruise news is back with a "Suri's Daddy" story. Fathers always have a soft-spot for their daughters, but it seems like Tom's affections go beyond the norm. 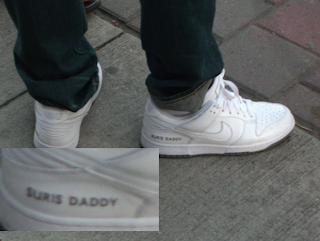 Etched on his whiter-than-white Nike Air Force 1s are the words "SURIS DADDY." The photo was snapped while the too-cute duo were enjoying a midday treat at my favorite local hotspot, Hotel Gelato. Branded with your daughters name - now that is some over-the-top love. If only all dads were this dedicated to their little princesses!